Sunday August 4 is the President's birthday. He is 52. 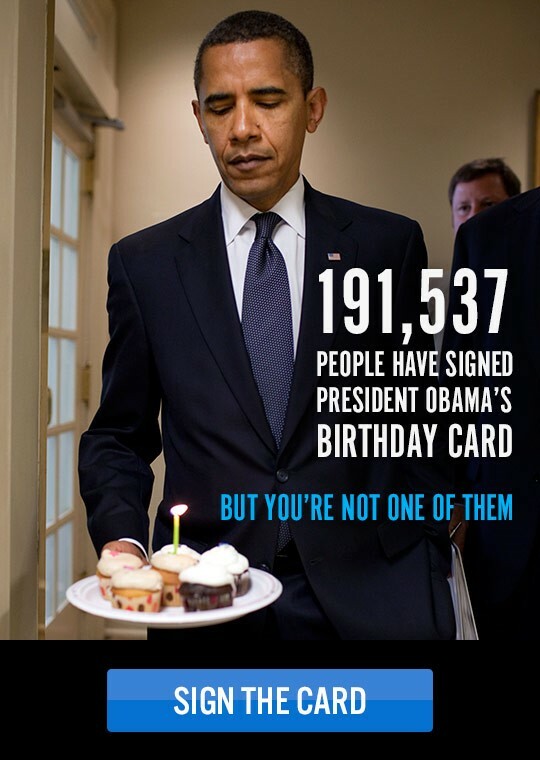 I hope he gets more than one candle on a lousy cupcake, but Democrats are never very generous with their own money. Some party. Meanwhile, the folks at democrats.org try to lay a guilt trip but manage instead to feed into fears that they are collecting and analyzing data on millions of Americans. Well that explains all articles in my MSM news page about right-wingers hate the president and how he once may have been mistaken for a waiter and how people lock their car doors when he walks down the street. It is interesting to read what people say in the comments. I am kind of amazed at how much people seriously dislike him, but yet they voted for him. Comments No Longer Banned From Althouse?